That’s the thought of Matthew Tetreault, a young man from Champlain, currently discerning a call to the priesthood. The richness of such fellowship is at the heart of the Fishers Club, the diocesan priesthood discernment initiative. These men, as well as several others, regularly gathered in two regional groups for prayer, discussion and camaraderie, beginning early this year. The Midlanders met at St. Mary’s, Canton, while the Lakesiders convened at St. Peter’s in Plattsburgh. Father Bryan Stitt, pastor of St. Mary’s, Canton, gathered with men in the Canton area. How is success measured for the group? The simple goal of the Fishers Club is to bring together men to consider the one thing they have in common: the awareness of a call to the Priesthood. Hearts do open as experiences are shared within the context of a group discussion. At each meeting, prayer in common and a relaxing meal further the fraternal atmosphere. Hopefully, time spent with the Fishers Club will continue to provide men with a sense of direction as they respond to the Lord’s ministerial call. Interested men of high school junior age and above will have the opportunity to gather for discernment when the Fishers Club resumes next fall. 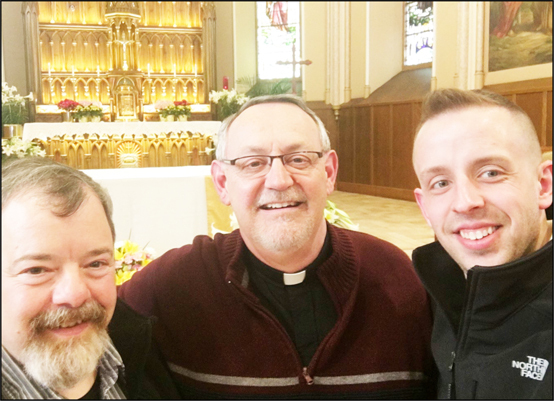 Father Howard Venette, pastor in Old Forge and moderator of the Lakesiders’ Fishers Club in Plattsburgh, center, is shown with two members of the club, Thomas Middleton and Aaron Akey after a recent meeting at St. Peter’s Church in Plattsburgh . The Fishers Club is a diocesan initiative for men discerning a vocation to the priesthood. A second group - the Midlanders - meets in Canton with Father Douglas Lucia, diocesan vocation director; and Father Bryan Stitt, pastor in Canton.